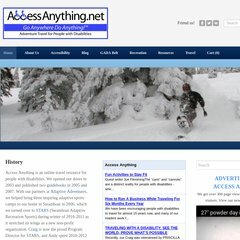 Topics: Accessibility, Travel, Travel Guides, Travel Camps, Travel Tools, and Bios. It is hosted by Theplanet.com Internet Services Inc (Texas, Houston,) using Apache web server. It has 2 DNS records, ns869.websitewelcome.com, and ns870.websitewelcome.com. Its local IP address is 174.122.144.19. PING (174.122.144.19) 56(84) bytes of data.